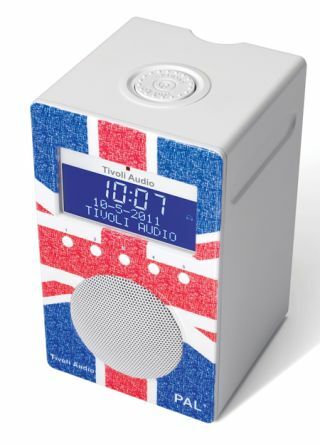 Tivoli Audio unveils PAL+ Union Jack DAB/FM radio | What Hi-Fi? There must be a Jubilee on or something. We arrived at work today to find the office staircase festooned in bunting, then Sky unveiled its new Union Jack universal remote, and now Tivoli Audio has slapped a Union-Jack emblazoned case on its PAL+ DAB/FM radio. It's weather resistant – ideal for the vagaries of the British climate – has a built-in rechargeable Nickel Metal Hydride (NiMH) battery, sports a headphone socket and 3.5mm input jack for your portable. There's an optional carry bag and a fully charged battery delivers up to 10 hours of on-the-go listening. The Tivoli limited edition Union Jack model will be joined by the BBC Children in Need design we reported on earlier, due on sale this autumn.